First, Tokyo is huge. It’s the most populated metropolitan area in the world, with about 37 million people. 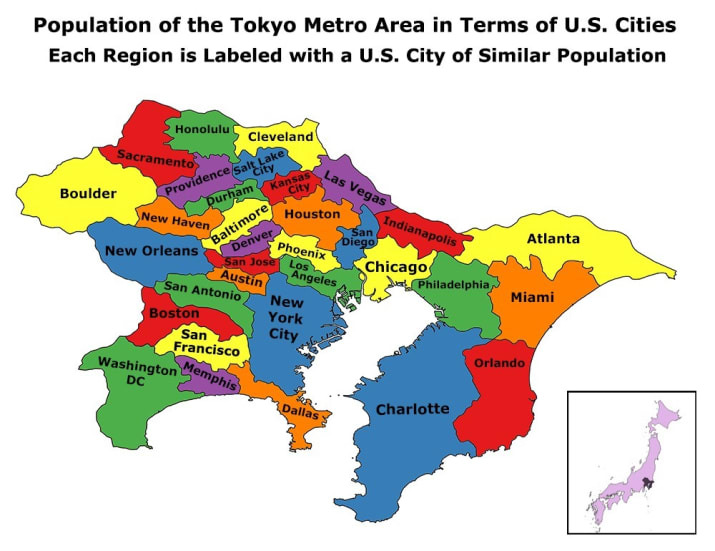 To put that into perspective, below is a map of Tokyo from reddit user hlake that compares Tokyo’s districts to U.S. cities of similar populations. When you realize that visiting Tokyo is like visiting New York City, Chicago, Los Angeles, San Francisco and over a dozen other U.S. cities all at once, you see why I chose to spend nearly two weeks there, hopping among four different hostels in the process. Even still, I only scratched the surface of what Tokyo has to offer. (For more visual explanations of Tokyo’s size, check out this, and I can’t believe I’m typing it, Buzzfeed listicle.” I should also mention that Tokyo has made me appreciate Hong Kong’s MTR subway system even more. Tokyo has not one, but two subway companies with their own individual lines. If you have to cross from a line owned by one company to a line owned by another, you have to leave the station, walk to the other company’s station down the street, buy a second ticket and be on your way, which is both pricey and time-consuming. Since the Tokyo metro is about twice as expensive as Hong Kong’s MTR, it really adds up when taking several trips per day. Other than that, Tokyo is fantastic. Each district has its own distinct feel, some of which are nutty. For example, Akihabara in the northeast is essentially the nerd district, filled with both retro and modern arcades (including VR), retro game stores, trading card stores, anime and manga stores, action figure shops, internet cafes and gacha machines everywhere (gacha is essentially like a gumball machine but for small collectible toys or figurines). Anime characters are plastered on billboards, music videos play on giant screens on street corners, costumed employees are hawking their themed ninja restaurants and owl cafes, and much more. Naturally, I spent a good amount of time playing in the arcades, collecting Pokemon memorabilia, and overall being a kid again in a pop culture wonderland, filled with bright lights and catchy J-Pop girl band tunes. One of the highlights in Akihabara was definitely the owl cafe I went to near the end of the trip. It wasn’t truly a cafe, since they don’t serve drinks, but I got to spend an hour taking pictures of and with owls. As part of the experience, I got to hold two of them: the aptly-named Gorilla and a softball-sized one I didn’t catch the name of. It was a surprisingly relaxing experience and a great way to finish off my week. I also tried sushi that wasn’t just a poorly-made California roll. My friend/travel buddy Cole took me to a conveyor belt sushi place that was delicious and fun. Basically, the chef stands in the middle of the restaurant making various kinds of sushi and placing them on colored plates that correspond to a price. The plates travel around the restaurant on the conveyor belt, and you simply take what looks good. When you’re finished, the staff tallies up your plates and you pay. I tried tuna sushi (plain, but tasty) and another kind I didn’t catch the name of, but it had a sweet chili sauce on it and was delicious. I’m not a huge fan of sushi’s texture, and I can’t convince myself eating raw fish is a good idea despite knowing it’s safe. But I’d be willing to try sushi alongside other dishes in the future. Definitely not something I’ll order as a main course, though. Another top-notch district was Shibuya, a shopping and nightlife district near Tokyo’s center. During the day, it’s a typical downtown scene, but it really comes alive at night thanks to its abundance of people, bright lights and street performers. As far as a vibe, think Tokyo’s Times Square. The district is famous for Shibuya Crossing, rumored to be the busiest pedestrian crossing in the world (especially at night), and its statue of Hachiko, a dog famous worldwide for waiting daily at Shibuya Station for his owner to come home, even years after the man died at work. (Check out his movie, Hachi: A Dog’s Tale.) I spent a while shopping and eating in Shibuya thanks to its Taco Bell, gyoza (Japanese fried dumplings) restaurants, record stores and more. As it turns out, a lot of my favorite artists also have followings in Japan, where they release exclusive tracks, deluxe editions and even full albums that never make it to the West. I didn’t buy any CDs, though I did snag a rare twenty one pilots Record Store Day exclusive vinyl that I’ve hunted well over a year for. Another interesting district is Shinjuku, which is similar to Shibuya. That’s where I visited the Samurai Museum, which has several authentic sets of samurai armor, weapons, artworks, replica pieces, and an informative tour that explained everything. I’ve always been fascinated by samurai, and I practice their techniques through kendo, so it was fantastic to see some real artifacts of the warriors. Shinjuku is also the home of the Tokyo Metropolitan Government Building, which is the third tallest building in Tokyo. Because it is in roughly the middle of the city, its observation deck offers a fantastic 360-degree view of Tokyo, which literally extends farther than the eye can see. I’ve been to the top of towers and buildings in a couple other cities where the line between urban area and suburbia is clear. But Tokyo is so massive that it seems to go on forever, and it’s breathtaking. Being at the deck puts into perspective just how big the city is. Highlight districts aside, plenty of other attractions fought for my attention, such as the Sumida Hokusai museum, dedicated to the artist Hokusai. You’ve undoubtedly seen his work known as The Great Wave off Kanagawa, and it happens to be my favorite piece of art. It’s a woodblock print, not a painting. 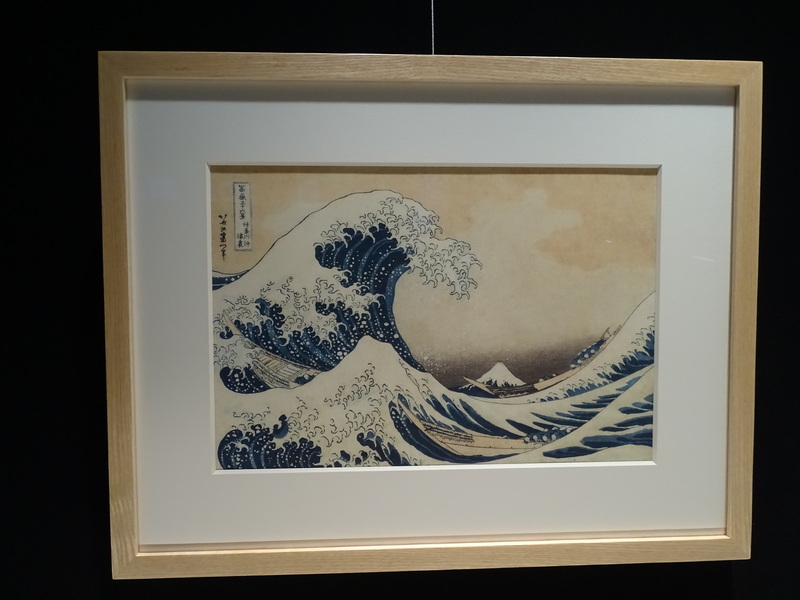 Hokusai designed the image which was then cut into a block of wood. Then, someone would apply a layer of paint to the wood, stamp it onto fabric, and repeat layer by layer until the fabric held the finished, fully-colored image. That process causes wear to the woodblock, and after so many prints, it becomes dull. Subsequent cloth prints don’t have the same vividness and sharp lines, making original, high-quality prints stamped as Hokusai designed fairly rare. The museum had not one but two of them on display. I’m no art critic, but the piece is simply fantastic, and the originals are as beautiful as I hoped. The colors are still rich, the lines are sharp, and the piece truly tells a story. I never honestly thought I would be able to see one of the originals, so seeing the piece in the artist’s hometown was a bit surreal. Another highlight was going to a Tokyo Yakult Swallows baseball game. My grandpa hooked me on baseball as a kid, and while I don’t follow it anymore, I still enjoy going to games for the atmosphere. Live sporting events carry so much energy, and Japanese baseball fans take it to a whole new level. Baseball is the most popular sport in Japan, and the 38,000 seat stadium was sold out for the night game. The right side of the field was packed with Tokyo fans in green and blue, and the left half was a sea of red for the Hiroshima Toyo Carp. Both sides had their own chants for each player on the team, mostly in Japanese, then a handful of general chants of mixed Japanese and English. Some players even had songs that fans would sing about them as they were up to bat. I mean, this went way beyond your typical “Let’s go, [home team], let’s go! *clap clap*.” This was every fan joining in over a dozen different songs and chants, all led by a beatkeeping section in the outfield complete with drums and brass. They would play a couple notes that served as the cue for which chant would be coming next, and the fans would go into it, not only with their voices, but their mini plastic noisemaker baseball bats as well. When a Tokyo player would hit a home run (which happened twice), fans would stand up, break out mini fluorescent umbrellas and sing along to a sort of victory song as they raised their umbrellas high. Again, nearly every Tokyo fan in the audience had one or more of those umbrellas, just like you’d expect to see a sea of Terrible Towels at a Steelers game. The game itself was a thriller: Tokyo pulled off a win despite having the league’s second-worst record and Hiroshima owning the second-best. Hiroshima held a 2-1 league until Tokyo tied it with a solo home run in the bottom of the ninth. Both scored another in the tenth, then Tokyo put it away with a fourth score in the 11th inning. The crowd went WILD. Tokyo fans erupted with the sort of enthusiasm you’d expect from a championship win; even the grade-school kid next to me gave me an ecstatic high five. It was the perfect ending to a tight game. I’m glad there was closure, since regular season NPB games end after 12 innings, even if it’s a tie. Oh, and let’s talk about stadium food in Japan. The stadium sells KFC, ramen, yakitori (Japanese chicken skewers) and plates of nothing but sausages alongside classics like chicken strips and french fries, all for fair prices. Most interesting are the “Ghostbusters,” or purposefully attractive young ladies who walk around the stands pouring beers for only ~$7 USD from the kegs strapped to their backs. I watched one guy a few rows in front of me order at least three, seemingly just so that he could talk to the girl for a few minutes each time she stopped by. Solid business strategy. On one of my last days in Japan, I took the metro about 20 miles south to Yokohama, where I visited a museum dedicated entirely to Nissin instant ramen noodles and the man who invented them, Momofuku Ando. As weird as an instant noodle museum may sound, it was an informative walk through the history of the food, Ando’s life and how Nissin provided a cheap, quick way for people to eat on the go. I also went to the top of the Yokohama Landmark Tower, Japan’s second tallest building, which features either the world’s fastest or 2nd-fastest elevator. Usually, speedy elevators make me feel like I’m being plastered to the floor, but this one didn’t cause any sense of G-force, all while rocketing me up at 45 mph. Clear skies provided a fantastic view of the gorgeous bayside city from the building’s observation deck. On the way back to Tokyo, I stopped at the city of Kawasaki to do some thrift shopping and to ride the world’s smallest escalator. Yeah, Japan is goofy. I spent the rest of my time eating large amounts of soba, ramen, udon (all types of noodles), matcha-flavored snacks, tempura, Japanese-style curry, tonkatsu (tempura fried pork) and a personal favorite, dorayaki (pancakes with red bean paste). I discovered peach-flavored Coca-Cola (which was okay) and melon Fanta (FANTAstic) and probably gained weight in the process. I visited botanic gardens, a street lined with ginkgo trees, vintage shops, a cafe themed around kawaii monsters, the eeriest cathedral I’ve ever seen, an official Pokemon store aptly named the Pokemon Center, an entire mall of nothing but nerd goods, and yet I don’t think anything tops to my day at the base of Mount Fuji. When I started at Ohio Univeristy and joined the kendo club, I met another HTC student named Eric. He graduated and now teaches English at a school in a town called Gotemba on the eastern base of Mount Fuji. After a two-hour bus ride, Cole and I made it to the town, where Eric showed us a Shinto shrine, took us to a tonkatsu restaurant and drove us through the beautiful landscape. The highlight came that evening, when he drove us up a mountain pass across from Mount Fuji, where we watched the sun set behind the mountain. Empirically, Fuji isn’t that impressive, as it is “only” 12,000 feet tall. I’ve seen taller mountains in the Rockies, but those aren’t quite as picturesque. They’re rocky, craggy peaks that just so happen to be tall. Plus, those peaks being part of ranges diminishes their height. Sure, they’re tall, but not relative to the landscape around them. Don’t get me wrong, Yellowstone and Grand Teton National Parks are gorgeous, and I would love to visit again, but the mountain views simply don’t compare to Fuji-san. Fuji sits by itself, unflanked and unobstructed, gradually sloping up to its snow-capped, fairly symmetrical peak. Due to its past volcanic eruptions, Fuji has a rather flat summit. Since it’s so wide and not very steep, it absolutely commands the environment around it, taking up one’s entire field of vision, even from viewpoints miles away. Fuji is a natural wonder unlike any other, and it’s clear why Hokusai labored over dozens of artworks featuring it. It’s majestic and magnificent, like a gentle giant looking down upon the land all around it. Watching the sun set behind Fuji is something you can’t fully appreciate unless you see it yourself, and I am forever blessed for having that chance. Then when it was all over, I got back to Hong Kong and promptly lost my passport, snapping me back to reality. You live and you learn, I guess. But in all honesty, my trip to Tokyo was something like a dream. I’ve thought about it for so long that I was afraid it wouldn’t live up to the hype I created, but it smashed all of my expectations. Even in my imagination, I never thought I’d find myself at the base of Mount Fuji. I never thought I’d see my favorite artwork in person. I never thought I’d see a city so expansive it fades into the horizon in every direction. These were all surreal moments that capped off a trip full of the food, pop culture and bright neon lights that I always hoped for. And realistically, I didn’t think I’d step foot in Japan until after I graduated, got a job and saved up enough money and vacation time to go. But being on exchange in Hong Kong made it possible, thanks largely to the fact that a Hong Kong to Tokyo flight is about 5-8 times cheaper than a Columbus to Tokyo flight. I am forever grateful for everyone who helped me get to Hong Kong in the first place, because without you, none of these experiences would have been possible. I guess I’m reminiscing a bit, since I’m now back home to the USA. I did miss my family, friends, apartment and home-cooked meals. But this semester has also been the most exhilarating period of my life, filled with adventures, freedom, discovery and knowledge that neither a job nor classroom can provide. So it’s a bit hard for me to let go of the experience that many people are lucky to get once in a lifetime. And yet, there’s still so much more of the world to see. I want to explore more, and I hope this won’t be my last time in Hong Kong or Asia. But if for some reason this is the end of my travels, I finish this semester with no major regrets. I came, I saw, I conquered. I leave knowing I made the best of my time here, exploring places I have long hoped to and discovering new ones I consider hidden treasures. The end of my trip is bittersweet, but I am satisfied that I made the most of the opportunity. And I guess that’s what counts, right?